I offer Notary Services in the Union County Area and in the surrounding areas. 1. How does a notary find information about statutory changes that affect notary practice? Notaries can contact the Notary Section in the Department of the Secretary of State for their state, the county register of deeds office, or a local community college to learn about changes in the statutes that will affect a notary public. 2. What is a notarial act? 3. What are the notarial acts a North Carolina notary public is authorized to perform? North Carolina notaries are authorized to perform acknowledgments, oaths and affirmations, and verifications and proofs. They can also execute jurats. 4. If a notary resides in one county, can he or she notarize a document in another county? Yes. A North Carolina notary public may notarize documents in any North Carolina county. 5. May a notary certify a true copy of a document? No, a notary is not authorized to certify any document to be a true copy. 6. What is the difference between a jurat and an acknowledgment ? Are the terms interchangeable? No, the terms are not interchangeable. A jurat is that part of an affidavit or deposition in which the notary states that the affidavit or deposition was sworn to before the notary. A jurat can be expressed with the phrase Subscribed and sworn to (or affirmed) before me this the ____ day of __________, 20__. An acknowledgment is a declaration by a person that he or she executed an instrument for the purposes stated therein. If the instrument is executed in a representative capacity, the acknowledgment is also a declaration that the instrument was signed with the proper authority and executed as the act of the entity represented and identified therein. 7. What is the penalty for notarizing a document without the personal appearance of the principal? In addition to losing the notarial commission, a notary who performs a notarial act without the principal personally appearing before the notary is guilty of a Class 1 misdemeanor. If the notary performs the notarial act without the principals personal appearance with the intent to commit fraud, the notary is guilty of a Class I felony. 8. What other notary act violations are classified as Class 1 misdemeanors? 9 . What violations are classified as felonies? 10. Can an applicant who has been convicted of a felony become a notary? According to G.S. 10B-5(d)(2), the Department may deny an application for commission or recommission based on the applicant's conviction or plea of admission or nolo contendere to a felony or any crime involving dishonesty or moral turpitude. In no case may a commission be issued to an applicant within 10 years after release from prison, probation, or parole, whichever is later. 11. If a commissioned notary is convicted of a felony or other crime involving dishonesty or moral turpitude, what should the notary do? The notary should immediately stop acting as a notary and notify the Department. In most instances the notary will be given the option to resign his or her commission in lieu of revocation. 12. In what capacity may military personnel act as North Carolina notaries? Persons authorized to act as notaries by 10 U.S.C. 1044a and other federal laws may perform notarial acts only for certain categories of military personnel listed in those statutes. In doing so they are not acting as North Carolina notaries because their authority is derived from federal rather than state law. They may apply for a North Carolina notary commission if they wish. 13. If a notary notarizes a document, may he or she also act as a witness to that document? 14. How does a notary properly notarize a document for a person the notary does not personally know and who lacks the customary proper identification? A credible person the notary knows can verify the signer's identity. 15. May a notary take an acknowledgment by phone or fax? No. According to G.S. 10B-3(1), an acknowledgment is a notarial act in which an individual at a single time and place appears in person before the notary and presents a record, is personally known to the notary or identified by the notary through satisfactory evidence, indicates to the notary that the signature on the record was voluntarily affixed by the individual for the purposes stated within the record. 16. May a notary acknowledge two signatures if only one of the signers is present? 17. 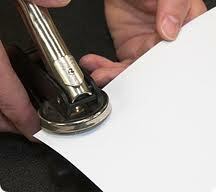 What is the procedure for notarizing the signature of a person who cannot write but who signs with a mark? A mark can be considered a signature in North Carolina, and the procedure is the same as for any other personal appearance associated with a notarial act. The notary would include the following language under the signer's signature (mark): Mark affixed by (name of signer by mark) in presence of undersigned notary. 18. May a notary public notarize a document that is in a foreign language? Yes, but the notarial certificate must be in English. G.S. Chapter 66 requires an English translation of the document for authentication. 19. How is a notary's signature authenticated on a document in this country? Information on authentications may be found on the Department's Web site at www.sosnc.com. 20. How is a notarized document authenticated for use overseas? 21. Is a notary applicant who took a course of less than six hours and who submitted an application after December 1, 2005, required to retake the course? Yes. All applicants for initial appointment as a notary public who submit an application postmarked on or after December 1, 2005, must take a course of not less than six hours within three months prior to filing the application. 22. What are the testing requirements for initial appointment applicants? An applicant for initial commissioning as a notary public must pass an examination (scoring 80% or higher) at the conclusion of the six-hour course. The test will be administered by the notary public instructor. 23. Will incomplete applications be denied? Yes. All questions on the application should be answered completely. According to G.S. 10B-5(b)(8), a person shall [s]ubmit an application containing no significant misstatement or omission of fact. 24. Can notaries use initials or nicknames in the official commission name? The notary's stamp or seal name and the notary's signature must match the commission name. 25. Is the applicant information submitted to the Department considered confidential? 55. Must a notary's seal or stamp and signature be placed on the same page? 56. When notarizing a vehicle title, should the notary charge the fees set by G.S. Chapter 10B or those charged by the Division of Motor Vehicles (DMV)? North Carolina notaries charge the fees set by G.S. Chapter 10B. Tag agents in DMV offices charge the fees set by G.S. 20-42, which states that the DMV has authority to administer oaths and certify copies of records. 57. When a notary is notarizing a vehicle title, are both the purchaser and seller required to be in the notary's presence? Notaries should direct questions regarding vehicle titles to the DMV at 919-715-7000 or consult the DMV Web site at www.ncdot.org/DMV. 58. Is a notary responsible for the proper completion of an assignment or reassignment of a vehicle title when notarizing these documents? The notary must ensure that the document is complete above the notarial certificate before performing a notarial act. 59. Is a notary responsible for putting a lien on a car? 60. May a notary notarize an assignment or a reassignment of a vehicle title for his or her spouse? 61. How much can a notary charge for a verification or proof, since the notary is both witnessing a signature and giving an oath?